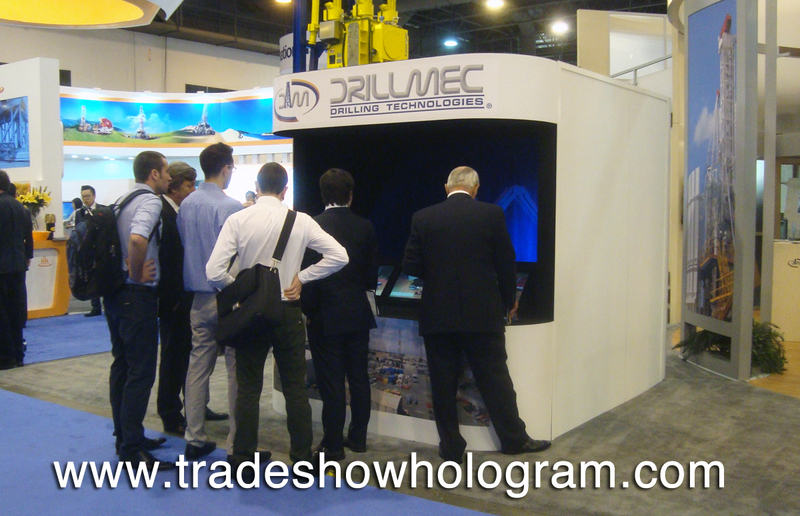 Trade Show Holograms recently displayed one of their newer 3d hologram projector designs at the OTC 2014 in Houston Texas. This was the second showing of the new projector which features 3 front video monitors in addition to the 3 ft high and 5 ft wide holographic images floating in mid air inside the display. The design is based on the FIONA model of kiosk featuring a life sized holographic virtual presenter. ( FIONA ) The addition of the 3 monitors, new curved back wall and a wider display area make this unit a step up in the Hologram Display Series offered by Trade Show Holograms. The display proved a success in attracting crowds to the trade show booth. Large Hologram Projector attracts attention at a recent Trade Show in Houston Texas.